The messy conglomeration of marketing and communications disciplines has made for some challenges and some opportunities. One of the many disciplines we advise on and manage as an agency is social media. Increasingly we have found ourselves acting in a first-responder capacity with dissatisfied customers of our clients. Social media has become the front lines of customer service for the connected customer. Our first challenge is to help our clients see this as a good thing. Challenges with customer expectations is not new for businesses, and neither are customers that voice their dissatisfaction. Now we have new ways of tuning into brand related chatter and engaging the customer. This creates an additional opportunity to retain customers and demonstrate care in highly visible manner. Churn [read: loss of customer loyalty] is directly related to our inability to overdeliver or our propensity to underdeliver, relative to our customers expectations of how they deserve to be treated in the first place. Expectations are a powerful thing. Especially considering that we are often not the ones who get to set them. Expectations are often proportionate with product cost if you are in the luxury product business. If your product costs more, the expectations are much higher. Fair or not, if a customer pays more for a product, there is a greater expectation that the company will go the extra mile to stand behind its product. This reality is not isolated to social media, customers have always had higher expectations for luxury products. However, these higher expectations for white glove service have been extended to the online experience. Blaming the customer in a public forum is never worthwhile. Remember that social often means public. You would never have it out with a customer in the middle of a showroom. Listening with an open mind and responding graciously should always be your initial posture. The initial response from a brand online can have a significant effect on the rest of the conversation. A positive response that is receptive and helpful will increase purchasing intent by others online. Likewise, your response could be seen by many other existing or future prospects as a testament to your commitment to customer service, good or bad. Furthermore, studies show that a response that provides insights about the best use of your product is a powerful conversion tool when seen by others. – Responding to poor customer feedback increases purchase intent. – Brand responses improve product sentiment among potential buyers. – Lengthier, more detailed, and more balanced customer feedback is considered most helpful. – Reviews often contain calls to action – opportunities to respond. 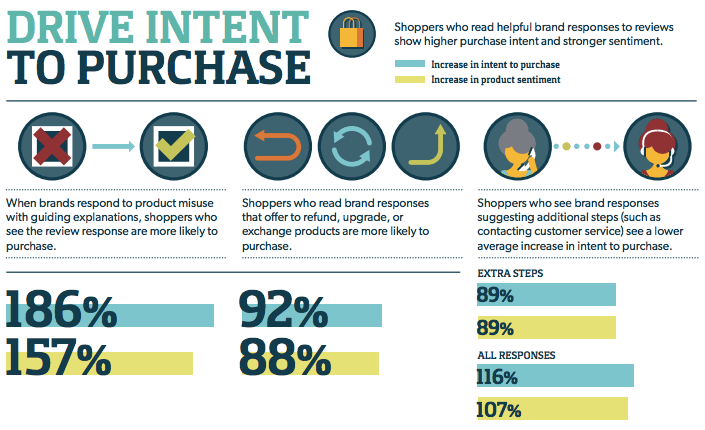 Study participants that witnessed brand responses to negative reviews with helpful experienced a 186% increase in purchase intent when compared to participants who saw no response (see chart below). A wealth of opportunity can be found for brands that choose to engage with negative user comments and posts online. In doing so, brands live up to the higher expectations set by users while also increasing purchase intent in those who witness these exchanges.